Isn't it time to get up? 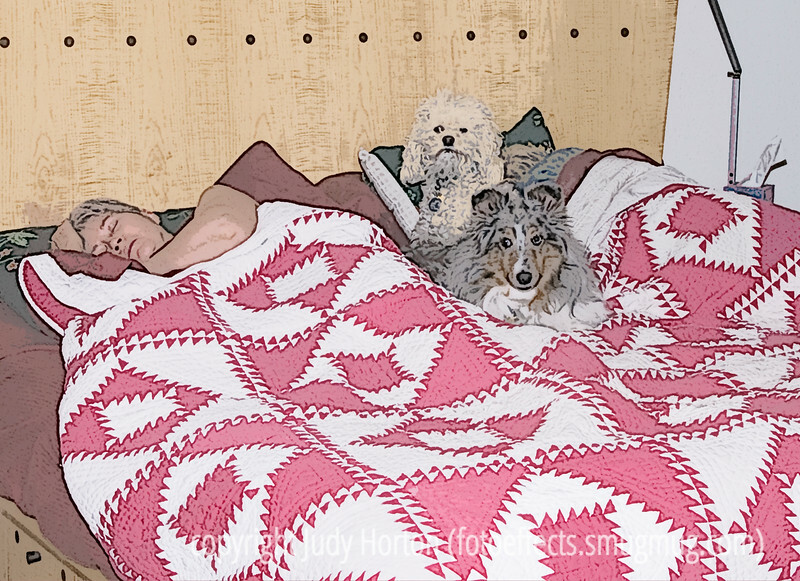 Judy and Phil try to get a few extra winks, but Buckwheat and Willoughby are ready to rise and shine. This image has been processed to give it more of a posterized look. Thanks to all of you who provided a critique for my shot of the skateboarder and the suburbia HDR shot. It was extremely helpful and I really appreciated the suggestions. Have a great Sunday everyone! The Monday Challenge this week is "Lexicon" and I have had a lot of fun today shooting various iterations on that theme. I'm excited to see what everyone else comes up with on Monday morning. Those poor dogs... they look like they have it really bad. Just like a couple of dogs to squeeze you off the bed....this PP effect is different than any I've used in photoshop. I've enjoyed looking at your gallery and like the frame effects you use - what software/program are you using for these? Thanks. Love the truck with turbine blade and your birds. Interesting shot and great pp. The color mix really makes the shot pop.